This is an old yet very simple tip to find the IMEI number of your lost or stolen Android device (phone / tablet). In layman’s terms, IMEI number is an unique number to identify your device. If you have lost your device or if it is stolen then you’ll be needing this number to file a case (police or insurance) or maybe to track the device with the help of cyber crime. Frankly you will have so many apps and tweaks to find the IMEI number of your device, but what if you don’t have the device?! What if it is lost or stolen? What if you can’t remember the IMEI number?! Don’t worry, like always, Google is here to help with that. Of course, only if you are Android users. 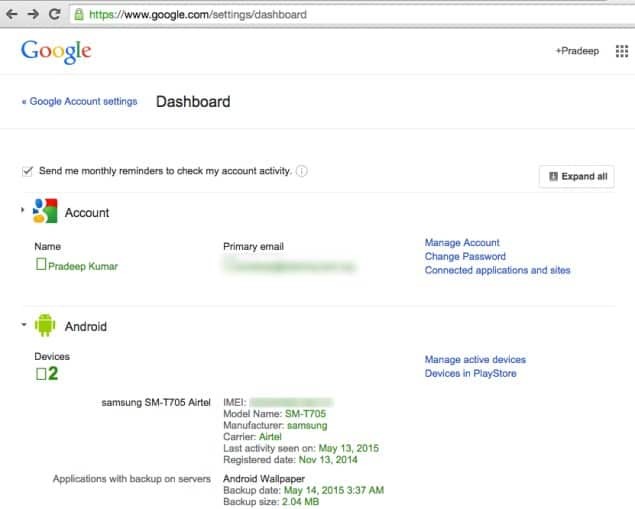 Go to your Google Dashboard, login if you haven’t (with the Google account you used for your device), and now you’ll find a division called “Android”, below that you can find the list of Android devices connected with your Google account. You’ll find all sorts of details including Model Name, Manufacturer, Carrier, Last activity seen on, Registered date, and yes, IMEI number! See? As simple as that. It is also recommended that you note down this number elsewhere, just in case, for handy purposes. Also we have written a detailed guide about protecting your Android device do check it out.